If you’ve decided to choose regular dumbbells over adjustable dumbbells then hopefully we’ve made your selection a lot easier as we’ve listed the best dumbbell sets in the table above. If you’re still undecided on what type of dumbbells you feel would be most suitable then check out our guide on adjustable dumbbells vs regular dumbbells, which will give you a break down on the pros and cons of the two types. Get more out of your dumbbells and use them as a kettlebell with the unique kettle gryp. Sure, it’s not for everyone, read our kettle gryp review to see if it’s for you. However, it’s a must have for any crossfit enthusiast and it saves plenty of space when used indoors. Available sizes – You’re probably quite likely to buy more than one set of dumbbells, for which you probably also want the same models but of different weights. 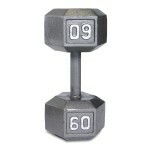 If you plan to go quite heavy then make sure the dumbbell model does come in that weight. The rubber coated dumbbells generally will only go up to 50 lbs per dumbbell whereas the CAP barbell solid hex dumbbell goes up to 120 lbs per dumbbell. 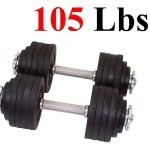 All the dumbbell sets in the table are a fixed weight other than the Unipack cast iron dumbbells which allow you to add or remove weights up to a maximum of 52.5 lbs per dumbbell. 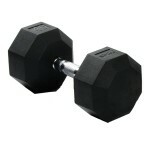 Material – The dumbbells will typically be made of cast iron, some will come coated with rubber which usually cost more. 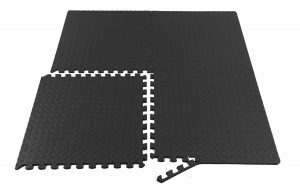 Having rubber coated dumbbells will probably give the dumbbell slightly more protection, but either way you should have exercise mats on the floor to protect your floor and gym equipment. Handle type – The handles that are covered with rubber may give you a better grip and won’t be so harsh on your hands, but if you wear weight gloves which most people do then the dumbbells without any cover on the handles shouldn’t affect the skin on your hands. 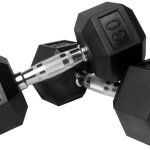 Price – As normal dumbbells don’t have as much variation and options like adjustable dumbbells do, the price will mainly be based on the weight and material used to construct the dumbbell. Features – As mentioned above there’s not too many different features a dumbbell can offer, so we’ve based this on the material, handle type and how many different weights is available for a particular style. Quality – The strength and durability the dumbbell represents is a vital factor, more so if you’re going to require a heavy pair of dumbbells. 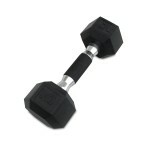 The last thing you want is for the dumbbell to feel like it’s going to break when you’re using it.